Suzuki GNCC ATV Series Hits Television Tomorrow "Tuseday"
The 2005 Suzuki Grand National ATV Cross Country TV Series starts tomorrow at 5 p.m. EST on the Outdoor Life Network (OLN). Half-hour coverage of the Lone Star ATV GNCC from Gilmer, Texas, kicks the series off, and the show will repeat Thursday at 11 a.m. and Saturday at 2 p.m. And those times are locked in for the rest of the season, so you can check out GNCC ATV Racing every Tuesday, Thursday or Saturday throughout the year. Show the Outdoor Life Network what your favorite form of outdoor recreation is by watching the Suzuki GNCC ATV Series on OLN each week! Morganton, NC – The conditions were tough, but factory Polaris ATV racer Matt Smiley was even tougher. Despite racing through rain and mud, Smiley dug deep and moved from nearly a last-place start to card an amazing second-place finish at the Steel Creek round of the Suzuki Grand National Cross Country ATV Series. Pre-entries are now available online for the 18th Annual White Brothers 4 Stroke World MX Championships April 23-24, 2005. 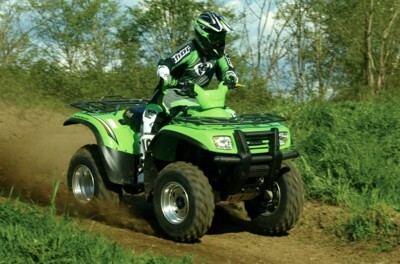 KYMCO USA, exclusive North American distributor of KYMCO brand scooters and ATVs, has renewed its sponsorship of two of the most popular ATV racing circuits in the U.S. The company will officially sponsor both the ATVA Nationals MX Series and the Kentucky State East & West MX Series. <?xml:namespace prefix = st1 ns = "urn:schemas-microsoft-com:office:smarttags" />Gilmer, TX – This weekend in Texas, America’s best off-road riders begin the fight for the most prestigious title in American off-road racing: the Suzuki Grand National Cross Country Series Championship. This year, some of the fastest off-road racers from around the world will challenge America’s best at every turn. American Suzuki’s success in the showrooms and on the race track has paved the way for an unprecedented off-road sponsorship program. Suzuki joins the Grand National Cross Country Series as the first-ever title sponsor of GNCC Racing, christening the series as the Suzuki Grand National Cross Country Series. ATV racers, Thad’s father Chad DuVall, GNCC Overall ATV #5 and the 2003 GNCC Pro Production ATV Champion. <?xml:namespace prefix = st1 ns = "urn:schemas-microsoft-com:office:smarttags" />Pennsylvania vet Jeff Miller will contest the Pro Am class for the team, and both riders will race Yamaha YFZ450s.